It’s Not Too Late To Sign The Petition To Make Alzheimer’s A National Priority…When? “Now!” said our President and CEO of the California Southland Chapter, Bettina Kurowski, in her speech on Thursday, July 22 as we applauded 5 riders that came riding into town from San Luis Obispo to join us in Los Angeles at Hollywood Blvd. and Highland while we rallied a crowd of people from all walks of life to sign our petition. Congratulations to the riders from UCLA Research Team who traded their lab coats in for bicycle shorts and jumped on bikes to ride for the cause: Sally, Greg, Edmund, Karyn, and Eric. Joining this remarkable team of UCLA cycling researchers, was our very own President/CEO of the National Alzheimer’s Association, Mr. Harry Johns who cycled his way into Los Angeles. As Mr. Johns addressed the crowd, he warned us that if we don’t change the course of Alzheimer’s, “it will cost Americans trillions of dollars, yes a trillion with a T,” in care, treatment, and services. Congress has failed to act over the years; therefore we must ACT, and NOW, to change the course of Alzheimer’s by signing the petition to make Alzheimer’s a national priority. Let’s also wish all the riders well as they travel the country, visiting more than 65 congressional districts and countless towns and cities. 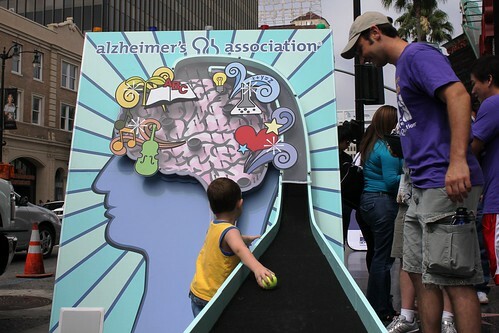 The time to ACT is NOW…as many as 5.3 million Americans have Alzheimer’s disease. In addition, we were reminded about those living with Early Onset Alzheimer’s, as the dynamic duo Susan Franklin and her husband Serge (members of our Early Stage Memory Club) shared their personal story about Susan’s early onset diagnosis and their challenges. We need your help as these dedicated cyclists make this historic cross-country journey to Capitol Hill to gather 50,000 signatures, arriving at Capitol Hill on World Azheimer’s Day, September 21, 2010. Sign the petition today and become a part of tomorrow’s solution. I am excited and proud to be a part of the Alzheimer’s Association Ambassador Team fighting for A world without Alzheimer’s disease.